I wanted to write a little note about some new features I've added to the contact lens searches in the last couple weeks. As a side note, this is something I'm really horrible at doing: I'm constantly tweaking and adding things to EyeDock, but then I forget to tell people about them. I like to spend my time doing the things I enjoy, which is building new features. I have to spend time doing things I don't particularly enjoy, which is keeping data up-to-date and answering support emails. Everything else always seems to fall be the wayside, which pretty much means everything related to business and marketing. So, with that in mind, I'm going to share some new features that you probably wouldn't notice unless you happen to stumble upon them. 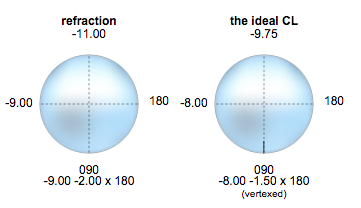 Distance Center or Near Center data for multifocal contact lenses. For years, I've been kicking myself for not including database fields for categorizing soft multifocals by distance-center or near-center. As I've read more and more about how these designs factor into myopia control, I realized it's something I really needed to address. So, I added these fields to the database, wrote code to search by them, and went through all the bifocal lenses and populated these values wherever I had the information. So, to search by this field, go to the contact lens searches, select the "More options", and then select "Bifocal Center" in the "even more options" dropdown. As always, you can combine this with any other search criterion. So, for example, you could search for daily disposable distance-center bifocal lenses or silicone hydrogel near-center lenses or anything else you want. As a result, you can search for lenses by these factors now too. I call the search bar at the top of the page the "Universal Search" because it has a TON of built in functionality. For one, it can be used to search all the databases: Soft Lenses, GP lenses, and Topical ophthalmic medications,and even link to external sites for things like ICD-10 searches. However, there are a lot of features that I'm sure have flown under the radar. 2. Abbreviations. For example, type "AOFA" as a quick way to search for "Acuvue Oasys for Astigmatism"
3. Search by company. For example, typing "Alcon" will let you see all of Alcon's lenses. 5. Searching by refraction. This is a subscriber only feature, but I believe it is EyeDock's greatest feature. I've written entire posts about searching by refraction so I won't go in to too much detail here but, if you haven't tried it, you're really missing out! Well, that's all I'll share with you today. There are a lot more things I should probably share with you, though, so I'm going to have to try to push out a few more posts like this so one. I need to make sure you're using EyeDock to it's fullest potential! It was brought to our attention yesterday that we had an error in our Pazeo listing. The recommended pediatric dosage for this medication is 2 years. Our listing incorrectly listed it as 2 months. We completely understand the significance of such an error and truly regret that it happened. These listings are manually, but very carefully, entered into our database by us. They are double and triple checked, but this mistake managed to slip through our evaluation process. We apologize for allowing this to happen and will increase our efforts to prevent something like this from happening again. I've made an update to EyeDock's [oblique crossed cylinder calculator](http://www.eyedock.com/index.php?option=com_jumi&fileid=3&Itemid=84). It still uses your trial toric lenses power, rotation, and over refraction to determine which toric lens to try next. However, I realized that this was still leaving some unnecessary work for the practitioner using this calculator. For one, it's nice to know that the *best* lens is one that corrects -4.25 diopters of cylinder with an 86 degree axis. However, I know that most lenses I regularly work with do not come in those exact powers. Traditionally I have looked up what powers the lens *does* come in and tried to find the closest match. This required rounding to the closest axis, reducing the cyl to the closest power the lens comes in. To make matters worse, I usually also need to adjust the sphere power to maintain the spherical equivalent to make up for my cyl power adjustments. Once I've made all these changes I start to wonder how big of an impact my compromises will make on the final result. How much will my axis rounding and cyl power reducing affect my patient's visual acuity? This is what I attempted to address with these calculator updates. I've added a feature that lets you enter which brand of trial contact lens you have on your patients eye. With this information the calculator can look up the available lens parameters on EyeDock and find the best match to the *ideal* lens. It will intelligently round to the best axis, adapt the cyl power to the closest option, and make adjustments to the sphere power as needed. It also gives you a sense of how close you are to the ideal lens by calculation the uncorrected Rx. From here it makes a prediction about what the potential visual acuity will be with this lens, which will enable you to make a decision about the lens's worthiness. Of course, the calculator may throw in its own 2 cents: If the potential vision seems poor it will suggest you try another lens brand. (1) Here's a little walkthrough of the calculator: I hope this allows my fellow clinicians to save a little time in their busy practices. As always, let me know if you have any thoughts or comments! -Todd Todd M Zarwell OD FAAO (1) If another brand was suggested, I was really, really tempted to have the calculator suggest some alternatives. However, I decided this was beyond the scope of this tool. For one, the calculator does not even know the patient's true refraction. For two, the oblique cross cyl calculator is making decisions based on how this particular brand rotates on the eye, but we can't necessarily expect another brand to behave the same way. Do to these information limitations I decided it would be presumptuous to try to make a suggestion about alternative lens brands and powers. My advice would be to type in the patient's original refraction into the search bar and start from scratch. A new study investigating plaquenil (hydroxychloroquine or HCQ) toxicity and dosing, The Risk of Toxic Retinopathy in Patients on Long-term Hydroxychloroquine Therapy 1, was published last year. This has prompted me to reevaluate and rewrite EyeDock’s plaquenil risk calculator. I was actually quite happy to do this as the new recommendations provided some clarification about how suggested plaquenil dosages should be calculated. The previous convention2 suggested a daily dosage no higher than 6.5mg/kg of body weight daily. The recommendation was to use ideal body weight - a calculated value using your patient’s gender and height - rather than real body weight. However, as I wrote my original calculator, I found that there were some significant differences in the recommended daily dosages when using real vs. ideal body weight. At that time I decided to write about this in a blog post, Daily Plaquenil Dosage - Crunching Numbers. … because of these findings, we have used real body weight for all subsequent presentations in this article and 5.0mg/kg of real body weight as a division between judicious and excessive use. How does this affect our calculations? Of course, changing this formula will change the results of my calculator. As always, I highly recommend that people using this calculator understand what conventions it uses. It’s critical to understand its output so you can interpret the information, assess risk, and make proper decisions for your patients. Since 200mg bid (400mg/day) has traditionally been considered a “typical” dosage, we’ll look closely at this value. Therefore, a 400mg daily dose of plaquenil (or less) would have been considered appropriate for anyone weighing at least 135 lbs. With the new recommendation, a patient should not take 400mg plaquenil daily unless their weight is at least 176 lbs. As I discussed above, the old recommendations also suggested taking into account ideal weight as opposed to true weight, although it was a little unclear as when and where this should be done (this was focus on my aforementioned blog post ). I decided to explore this more closely in the folowing graph. The green (6.5mg/kg) and blue (5.0mg/kg) lines look “safe” HCQ dosage calculated by true body weight and are virtually identical to the previous graph. This is represented by the yellow line in the above graph. Since the ideal weight is independent of her true weight the yellow line is perfectly horizontal. By this standard, a 5’4" woman’s ideal plaquenil dose is always 356 mg/day or less. … the prevalence of retinal toxicity relative to real body weight is essentially independent of body habitus, whereas the risk is much higher in thin individuals using their ideal body weight. The concept of using ideal weight for an overweight individual seems, on the surface, very logical. Adipose tissue does not absorb hydroxychlorquine and therefore shouldn’t be considered in “safe” dosage calculations. The concern was that, if real weight is used in these calculations, it may overestimate the dosage and put our patients at risk for retinotoxicity. This can be seen in the blue zone on the right side of the above graph. While calculations using 5.0mg/kg (the blue line) do recommend higher dosages than those using ideal weight (the yellow line), they are significantly less than the former calculations that used 6.5mg/kg (the green line). On the other hand, the opposite situation is also true. An underweight individual will have an ideal weight that is greater than their true weight. If ideal weight is used to estimate the appropriate plaquenil dosage it will suggest a higher daily dose than would be appropriate. This can be seen in the orange zone on the graph. The ideal weight calculations (the yellow line) recommend higher daily dosages than the other two. The 6.5mg/kg (the green line) recommends a lower dosage, but the 5.0mg/kg (the blue line) recommends the lowest of the three. We calculated the receiver operating characteristic curves to assess the sensitivity and specificity of real vs ideal body weight in predicting retinal toxicity and found that real body weight is a better predictor of retinal toxicity. Patients with a mean daily use exceeding 5.0 mg/kg had approximately 10% risk of retinal toxicity within 10 years of treatment and an almost 40% risk after 20 years. Patients using an intermediate amount of 4.0 to 5.0 mg/kg had a risk of less than 2% within the first 10 years of use but almost 20% risk after 20 years. … More important, from my own experience, is that optometrists and ophthalmologists get quality 10–2 fields (ideally Humphrey with SITA program and pattern deviation plots for white targets; or with red targets). And that they know how to recognize early suggestive damage. I see too many cases with severe toxicity because they either had no fields done (just fundus images) or the doctor got odd fields that were too large or insensitive or with defects discounted as artifactual variation. The adjunct of high resolution SD-OCT is also a very powerful early screening tool, and optometrists should do this or link with an office that can do this! Neither fundus exam nor fundus images by themselves are adequate or proper for screening, and can lead to lawsuits and blindness. Melles & Marmor. The Risk of Toxic Retinopathy in Patients on Long-term Hydroxychloroquine Therapy. JAMA Ophthalmolol. 2014;132(12):1453–1460. I have a question about your vertex calculator. If I try to vertex correct a refraction of -9.00-2.00x180, the diagram of the power cross that comes up on your website shows -8.00 in one meridian and -9.75 in the other meridian (a cylinder amount of -1.75), but the vertexed prescription is listed with -1.50 cylinder. It just seems like there is a discrepancy between your diagram and the vertexed prescription written just below it. Thanks for your help in understanding this. This question pops up every once and a while, and it’s a good one. This looks like a mistake, or at least a discrepancy, but it’s really simply a phenomena of rounding. If you take the -11.00 D meridian and vertex it, the actual value you get is -9.72. However, I like the optical cross labels to look nice and tidy, so I wrote the program to round this up to the nearest quarter diopter, -9.75. Similarly, the -9.00 D meridian ends up vertexing to -8.12. This gets rounded to -8.00 (but just barely - if it was more than -8.125 it would have been rounded to -8.25). As a consequence, one meridian was rounded up to -9.75 and the other rounded down to -8.00, so the optical cross seems to show a -1.75 D cyl power. However, the suggested cyl power uses the true calculated values, -9.72 and -8.12, and subtracts them to get the cyl power, which turns out to be -1.60 D in this case. Because I still wanted things to look pretty - and to be easier to compare to our real world contact lens options - this is rounded to 1.50 D.
In summary, when you see a discrepancy between the cylinder on the optical cross and the cylinder on the suggested Rx, the true, exact number rests somewhere between these values. However, rest assured that the cylinder in the suggested Rx will always be within an 1/8 D of the exact calculated power.